Under the tasty guise of soup, this story is really about facing your fears! Carlin is a scaredy-raccoon in need of courage. After Big Bear asks him to retrieve a special ingredient for bravery soup in a monster’s cave, Carlin shores up what little he has and sets off with the gifts of armor, food, and a stick from some well-meaning (but overwrought) forest friends. “Remember”, Big Bear says, “you are more brave than you think.” Carlin discovers he’s perfectly capable of navigating through the Forbidden Forest and Skulk Mountain by using his own wits instead. Finally, Carlin faces his fear and the cave monster to obtain the special ingredient box. He returns to a big cheer, but only to find the box is EMPTY! All’s well that end’s well though and Carlin learns that bravery isn’t in a box but in doing things you don’t think you can do! A tasty bowl of a story and a life lesson all in one. This story had the older class of 4 year olds entranced and they loved it! Maxwell Duck is back as chef extroardinaire in this hilarious book. Max is happily cooking away, trying to invent his own soup recipe. After realizing his special soup needs just the right something, Max trots off to find chives in garden. Enter his three goofy friends with big appetites. Mystified by Max’s disappearance from the scene, his friends are about wolf down some tasty soup when they notice an ominous feather in the broth. Chaos ensues as Brody, Dakotah and Bebe frantically strain Max’s soup and panic over his demise in carrots, potatoes and onions. Upon returning, Max witnesses the destruction of his masterpiece and sits at the dinner table looking understandably demoralized. But, as his friends point out, at least he’s not duck soup! A totally hilarious read for the kids as they realize Max’s “head” is really a potato, etc. All and all, a satisfying story time inspired by a satisfying meal. 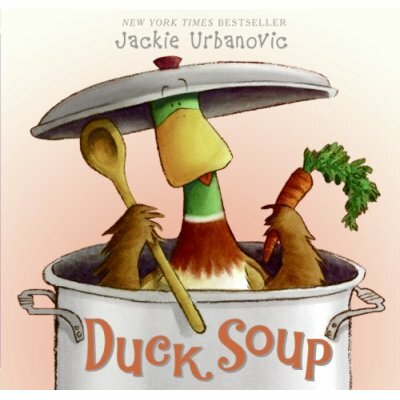 3 Responses to "A Good Day for Soup"
Don’t forget Stone Soup–an oldie but goodie in all its reincarnations. I have great luck with a flannel board version from Judy Sierra–Soup from a Nail– in The Flannel Board Storytelling Book, 2nd ed. The story becomes interactive as I call the kids up to add flannel foods to the pot, as we stir and stir and stir…some individual attention for kids in groups and a huge hit at storytime–guaranteed! fyi…i found you because my branch sent an email w/a link to your blog–she loved the name. Ann- I actually have a Stone Soup movie….one of those Weston Woods VHS tapes and used it in story time. I usually show a short film at the end of my stories that goes with my themes. I love the book though!!! Thanks for the suggestion. Especially the idea for the flannel board! I am always trying to expand my flannel board repertoire!